Welcome to another week of Fictional Attachments, where your favorite character always has a playlist, on KHDX 93.1. 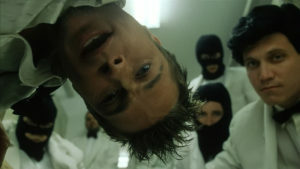 Tyler Durden and the Narrator inspired this week! I started off the show with the first chapter of Fight Club by Chuck Palahniuk. Yes, this is the book that created the cult classic film of the same name starring Brad Pitt and Edward Norton. Not only do I read a little excerpt from the book, but I also talk a little about the history of its success and its transgressive/philosophical nature. It would be insufficient if I said that the only aftermath of this film was that a very large portion of men changed their name to Tyler Durden after watching it and hundreds of underground fight clubs were created. Either way, this playlist is inspired by the actual albums Chuck Palahniuk listened to while writing this novel, The Downward Spiral by Nine Inch Nails and Pablo Honey by Radiohead. It also features “Where Is My Mind?” by Pixies and a few songs by Thirty Seconds To Mars (AngelFace’s band). Wreak havoc this week, space monkeys. This is your life and it is ending one minute at a time.